Culturaliv (‘i.v.’ as in intravenous) was created out of a love of the arts and a wish to inspire greater appreciation for – and participation in – the arts among everyday people. 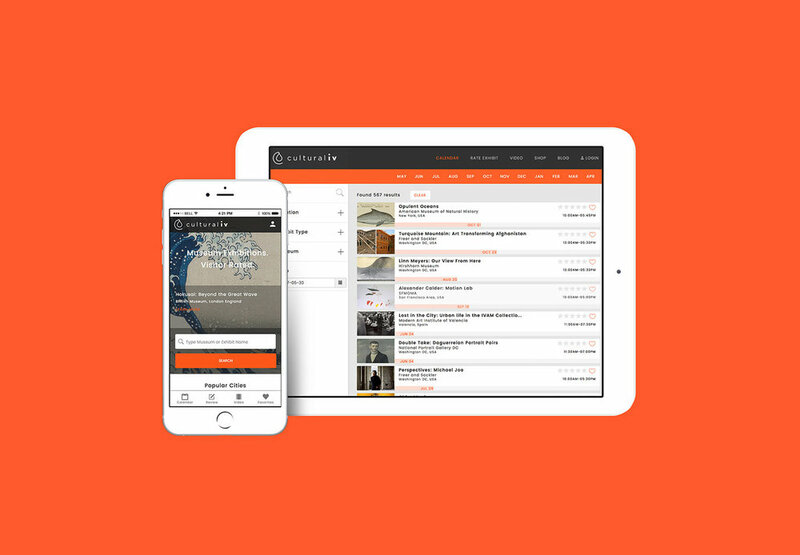 Thus, a museum discovery platform was born where local and international audiences are able find a definitive listing of ongoing and upcoming exhibitions at museums around the world. Within the platform, individuals can create profiles, save and review exhibits. Cultural institutions can create profiles as well, allowing them to manage their exhibit schedules and gain insights into museum attendance and experience. StudioRd Design partnered with founder, Timothy Heckscher, to help bring the brand to life. Using the intravenous reference as the core visual mark, the identity maintains a distinctive yet neutral voice that serves to lead the user in through the doors of some of the most respected cultural institutions in the world with the rallying cry, Find Exhibits. Invite Friends. Write Reviews.